Dedicated to its urban roots and ecumenical spirit, Sherrill House represents a century old tradition of attending to the needs of vulnerable elders and their families. As a place where caring for elders is paramount, Sherrill House is more than a 196-bed skilled nursing and rehabilitation center. Founded as the Trinity Church Home for the Aged in 1907 by Trinity Church in the City of Boston, the Home was hailed as one of the first of its kind in the community. In the late 1960s when the building became obsolete, the Episcopal Diocese of Massachusetts joined with the Board of Trustees of Trinity Home for the Aged and St. Luke’s Home for Convalescents and built a new skilled nursing home, Sherrill House, named after Bishop Henry Knox Sherrill. This new facility opened in 1970. In 1995, The Frank Wood Home in Mattapan merged its assets with Sherrill House, enabling Sherrill House to undertake a multi-year renovation and expansion project. This was completed in 2007, resulting in their current, 110,000 square foot, state-of-the-art facility. The Lawrence Chapel, named after the 7th Episcopal Bishop of Massachusetts William Lawrence, offers a quiet space for prayer and reflection. 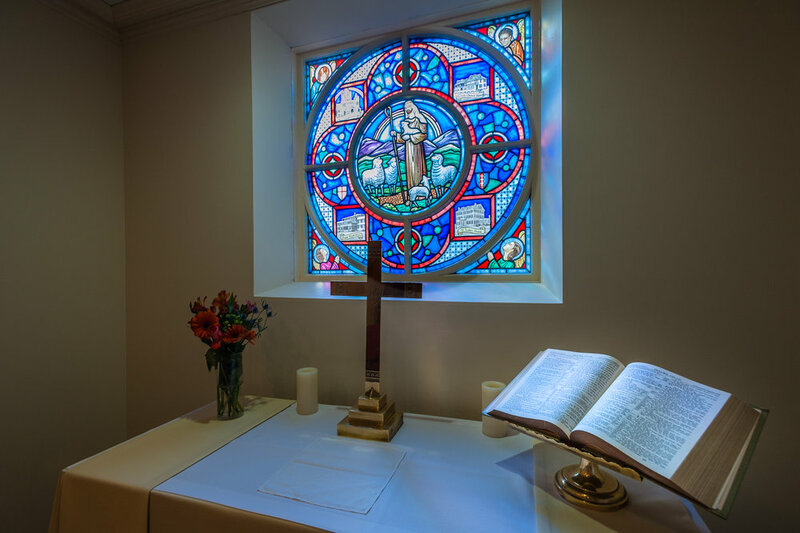 A rendering of the Window of the Good Shepherd by acclaimed stained glass designer and artist Lyn Hovey is the focal point of the chapel. The window depicts the image of the Good Shepherd surrounded by the four institutions that came together to form Sherrill House. The moveable altar is rolled throughout the facility to offer both Protestant and Catholic services to long-term care residents.